WATERFOWL AMMO IS HEADED IN THE WRONG DIRECTION! The latest technology in waterfowl ammo is producing wades that hold the shot together at greater distances, hardened choke tubes that strip the old style wades off and then try to tighten the shot pattern at longer distances. Faster and faster speeds, which I guess are offered so you can kill your birds quicker, limit out and get home? Some manufactures are mixing quality shot with less expensive steel, to keep the price down. You can be sure all this stuff works because someone with a awesome name and wearing loads of face camo, says it will. If that doesn't convince you, they will show a picture of a duck on a piece of paper with lots of pellet holes in it. The smartest man in the world once said that there are 3 types of lies; “Lies, Damn Lies and Statistics”. If you read the info on the box, one of the products shows a “pattern (that) represents 5 shot average”. Unfortunately a lot of birds out this way don't allow us a five shot average. It's that having to reload after 3 rounds that seems to be the problem. Although my thoughts are, fill my cartridge with the best shot, put all the powder in it that my gun can handle and I'll save up my money until I can afford to buy it. There is a advantage of mixing shot types and/or sizes in the same cartridge. What you see, is not what you get on the paper targets with a picture of a duck on it. First of all, that paper is a lot easier to penetrate than most birds. Secondly, all those pellets are not arriving at the same time. The distance between when the first pellet arrives on target (or more likely passes by the target) and the time the last pellet arrives, is the “trail”. Or at least, that’s what I call it. The trail is every bit as important as the pattern. The trail makes your leed more forgiving, and every bird hunter knows that is a area that we need a great deal of forgiveness. Note; the term “leed” is the distance that you must shoot in front of a moving bird, it has been misspelled everywhere else but the spelling has been corrected in this article. Different size, shape or weight of pellets mixed in the same cartridge are going to lengthen your trail, which is a big step in the right direction. Next you need to improve the pattern, not by putting more pellets in a paper bird, but by widening the spread of the pellets. There is a reason shotguns are used for bird hunting. Tight patterns are fine for the small percentage of great shots that can consistently hit a small moving target at 40 yards. For the rest of us we need the widest pattern that we can get, filled with some pellets that can kill the bird. One right size pellet that can penetrate the birds kill zone is all that should be necessary. All those other pellets only cause lost time and/or expense at the dinner table by picking out shot, or breaking a tooth on a pellet that you missed. Pick the smallest shot size that can kill the birds that you are hunting. The better the quality of the shot, the smaller the size. In my opinion Hevi-Shot is the best load on market, #6, 2 ¾” is a good load for most ducks. For larger birds such as Black ducks, Scoters and Brant, #4, 3” works well. For Canada geese #2, 3”. For Snows #2, 3 ½” works best. 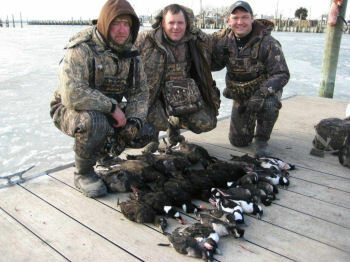 If you are just getting started at waterfowl hunting or are limited to a few days a year, chances are you are going to have a little trouble hitting flying birds no matter what type of ammo that you are using. Some of the super loads can get pretty pricey and hunters have been killing waterfowl with steel for years. Hevi-Metal has a mixture of 2 different loads, which will give it a longer trail and you a more forgiving leed. It is also more affordable. One of the most commonly asked questions that I get from hunters is “what choke should I use?” My answer is and has been, “you can't choke steel” Chokes were designed to compress lead, which is a soft metal. The only person able to compress steel, is Super Man. When steel first came out, it was wearing out barrels and chokes. Choke manufactures started producing chokes made for steel loads. These chokes are made of hardened metal to hold their diameter and labeled for “steel”. This doesn't mean that they can compress steel, it just means that steel won't distort or wear out the choke. The steel shot does not touch the barrel, or most chokes,because it is encased in a plastic wad. When you try to choke steel shot, it is just compressed into the plastic wad. When and if it comes out of the wad is anyone’s guess. Often, some of the pellets never come out of the wad. Steel should be shot from Open Cylinder, or at most Modified or Improved Cylinder. Another commonly asked question is “how far should I leed the bird?' That's a great question, because it shows that they realize that they have to do it. Unfortunately there is no good answer. Your leed on a flying bird depends on many factors, all of which change on every shot. These factors include the speed of your shot, the speed of the bird, the angle of flight, the distance, weather conditions and your method of leeding. It can be summed up by saying, PRACTICE! Sporting clays or any form of shooting clay pigeons can be helpful, but it is important that you shoot the same or similar loads as when you go hunting. Shooting lead at clays and steel at birds can be worse than no practice at all. The 2 loads travel at different speeds. Steel is faster in close, but falls off quickly. Lead is slower out of the barrel, but has more down range energy. Ballisticlly, Hevi-shot is very close to lead, or at least close enough to use lead to practice with. If you are going to shoot steel in the field, you need to shoot steel in practice. Speed is important, your shot must be able to travel faster than the bird that you are shooting at. No matter how fast your shot is traveling, you are still going to have to correctly leed your bird. All other things being equal, the only way to make your shot travel faster, is to make it lighter. The amount of powder that your gun can handle is limited. To make the load lighter you either have to remove some of the shot, or use a lighter weight metal. The lighter the weight of the metal, the less down range energy (killing power) it has. Less shot, means less pellets in your pattern. Find out what you are sacrificing to get the speed, in my opinion, that you really don't need. One of the most deceiving statistics is the advertized speed of ammo, its measured at the end of the muzzle. A lot of the birds that we are shooting at are a bit further out than that. The most important speed is that where “A”, (the duck) and “B”, (your shot) are supposed to come together. Pick a good quality shot, stick with it, don't choke it, practice your leed and good things will happen.